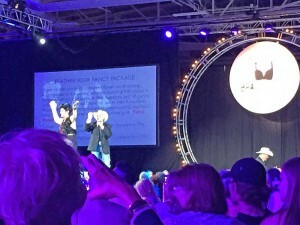 Bra Couture KC’s annual event is an extraordinary auction event showcasing eclectic work-of-art bras modeled by breast cancer survivors to celebrate their triumph over cancer. The event celebrates breast cancer survivors to raise funds for Kansas City area organizations who are aligned with their mission. The mission of Bra Couture KC is to provide life-empowering services to uninsured and under-insured individuals in the greater Kansas City area who have been touched by all cancers. A tribute to survivors’ fighting spirit, Bra Couture KC benefits The University of Kansas Cancer Center programs and services, such as The Patient-in-Need Fund at Missys’ Boutique, which is an accredited appearance center at The University of Kansas Cancer Center’s Richard and Annette Bloch Cancer Care Center. House of Diamonds has supported Missy’s Boutique in the past and that’s how we found out about the Bra Couture event. Karen and Bianca attended the event on April 1st. House of Diamonds donated a matching earring and necklace set for the live auction. 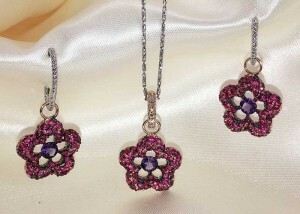 Karen custom designed the earring and necklace set with pink sapphires and amethyst to match the bra that was going to be auctioned. Bra Couture KC raised $4,000 with our donation during the auction! Instead of a traditional sit-down dinner, they had restaurants from all over the KC Metro with food stations at the event. Each restaurant had sample portions of their wonderful food. It was a great evening to raise money for a good cause. House of Diamonds is committed to giving back to the community. If you are interested in learning more about Bra Couture KC, be sure to visit their site!